In these times of gross uncertainty, it’s good to know there are a handful of people still on the same wavelength as me, especially when so many are now broadcasting on an entirely different band. And when one of those people on my wavelength successfully completes an eight-year project to get his book of short horror stories published, I am only too happy to do what I can to help get it some extra publicity. 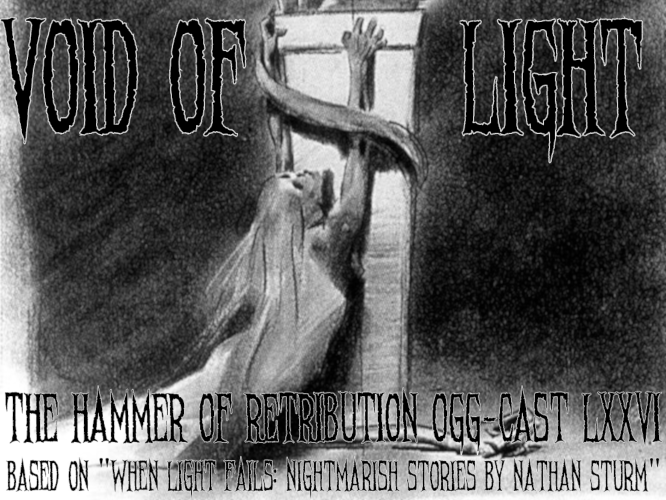 Hence, this Ogg-Cast, which is based around the sixteen tales of both splat-gore-shock-horror and the implied terror of what might happen than what does – “When Light Fails: Nightmarish Stories by Nathan Sturm”. A second diamond geezer worth crediting is Ben Corkhill, the man behind Oakenshield, which finally made it to the live arena after eleven years at Ward Rock Hell Vikings, two weeks ago. Seeing as I’ve long been a supporter of his band, Ben put me on the guest list so I wouldn’t miss this momentous event, and so I will remind you of his works with a secondary Spotlight – four tracks from both Oakenshield’s initial run, and the recent resurrection. There was an initial idea for this show before I decided to switch to reviewing Nathan’s book in musical form. Unfortunately, I told Lennard a bit too late so we’re missing Tunes Of Yore. No worries, though, I’ve filled in this time and will make it up to him later. Here are some useful links so that anyone who wants to buy the book (and why wouldn’t you, after this?) can do so.